SEO means that “Search Engine Optimization” which is a free marketing technique and it’s benefits are long term basis. But many people doing the black-hat SEO. Means they can use SEO for wrong purpose, which is benefits for some times, but when search engine algorithms find them, their site ranking drop down, and sometimes blacklisted. Still now, SEO is being now a SEO. But many things if you don’t know about it, you can doing it wrong, and as a result you will get your all work destroy. 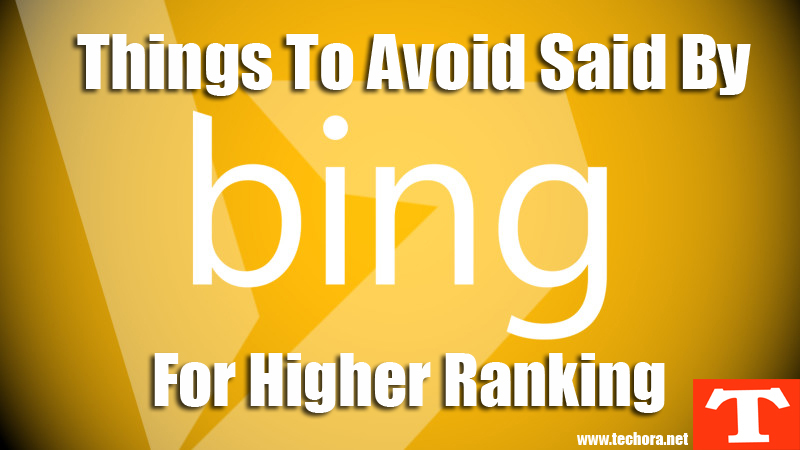 Here I’m discussed some important things that Bing Search engine said that, to avoid these things , and doing proper SEO tips and techniques for ranking in search engine. In the past, keywords is the only source for search engine to rank any website or blog . People can use different keywords and target their audience . But with the passage of time, search engine understanding about this fact. Because people can add more than keywords as much quantity search engine allowed. Also people use different keywords for many different topics. Means topic is different, but targeting keywords are different. Keyword Stuffing basically a quantity of the targeting keywords which you use in the single post. Not use more keywords just for ranking purpose , make your contents reader friendly. Don’t violate the terms and conditions about keywords of all search engines, especially Bing. Content Duplication is the biggest factor of getting down your ranking. Stealing other contents, posts, images, videos, are not allowed by search engines to use them . If you use duplicate content along multiple URL’s, Bing losing the trust of that URL over the time. So don’t doing that work. If you write an aritcle on any topic, not rewrite same article using different title and URL, because it contains duplicate contents. Bing don’t allow it. Cloaking is something like mirrors. But wrong mirror, means you can show different contents to your visitors , but show same contents in different mode to search engine robots. Showing the different users content than the crawlers and spiders can be seen as spam tactic and droping down your website’s ranking. So Bing recommended you to be extremely cautions about the responsibility differently to the search engine robots and visitors and to not try cloaking technique. Spamming is the biggest factor of any website ranking drop in search engines. If any one doing spamming , their site will be banned by Bing. Links schemes may be succeed in increasing the total number of links pointing to your blog / site , they will completely fail to building quality links. Don’t become a spammers. Don’t buying artificial links just for ranking, because it may be harmful to you in near future. Redirect to your readers to the other page will be not a good idea. You can use this technique for something smartly. But of you use the redirects in website codes, like any one can be redirect after 20 seconds to the other sites. Bing doesn’t allow this technique. Like the link schemes, it is same like that. When you share your social links on different social bookmarking websites, don’t become a spammers. Only share your contents in a real way. Don’t use social media schemes for wrong purposes. Don’t use auto followers schemes like Twitter followers, Facebook likes, etc. Bing said that, these all are the wrong techniques, so don’t be use all these things and avoid them .